At last, discover the land of ancient magic - Britannia! Here is a place steeped in ancient magick and legends of faerie. Hidden powers, some older than the land itself, exist alongside humankind and have mysterious arcane agendas. Beneath the very nose of mortal society, age-old battles are waged across the kingdom for control of key places of power. Since the return of the sidhe, the fires of battle have burned like never before as both changelings and mages become involved in the struggle for Britannia's might. This long-awaited Changeling: The Dreaming supplement provides vital information on the changelings and mages of Great Britain. You are finally able to explore the homeland of fae legends and discover the truths behind British covens and chantries. 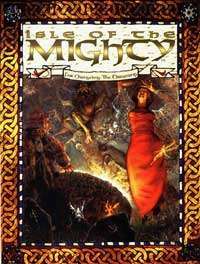 Isle of the Mighty exposes the vital link between mages and changelings and explains how they have been bound since the beginning of time. A complete World of Darkness sourcebook for Great Britain, including: England, Wales and Scotland. A new kith, the Gillhe Dhu, also known as "the greenmen," the protectors of the forests. Explores the politics and history of the fae and mages of Great Britain, from the ancient arrival of the Wieck and the Tuatha de Danaan to the modern day.